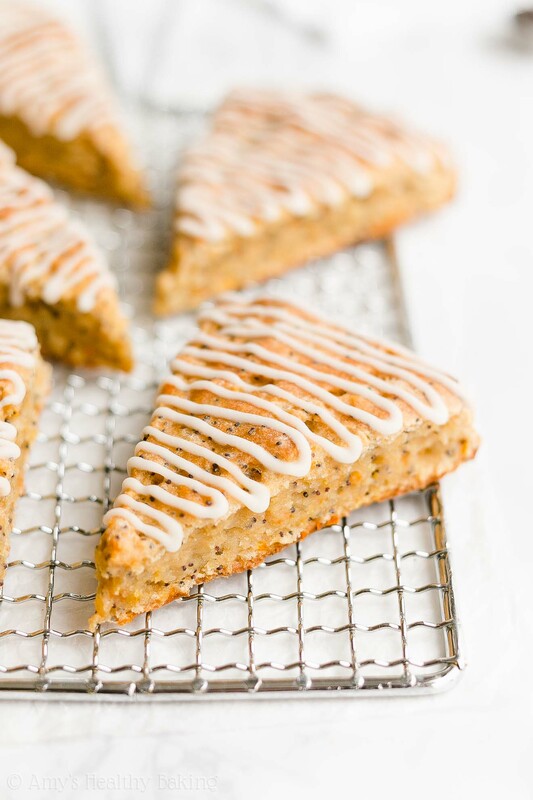 Learn how to make these easy orange poppy seed scones from scratch! You just need 1 bowl and 30 minutes. They’re just 139 calories with no eggs, refined flour or sugar! Perfect for lazy weekend brunches or a quick weekday treat! While visiting my grandparents in Arizona right before the holidays, I started feeling a slight tickle in my throat. I assumed it was a result of the arid desert climate (the extreme dryness even made my clothes and hair constantly full of static and cling to me at all times! ), and I completely dismissed the feeling, concentrating on drinking extra water instead. A few days later, I flew to Northern California to spend Christmas at my parents’ house, yet when I boarded the plane back to Southern California, I still noticed that tickle in my throat… And when I felt exhausted as I settled back into my seat just before takeoff, I realized I had actually caught a cold. Oops. When I arrived back at my own house that night, I found a single dose of cold medicine in my bathroom cabinet, swallowed it, unpacked my suitcase, and crawled into bed. When I woke up over 10 hours later, I headed to the store for more medicine—and lots of Kleenex! Before paying, I also grabbed some vitamin supplements. Although I take a multivitamin every day, I figured a little extra boost of vitamin C would be helpful! As I dissolved the supplement in water back at my house and sipped that orange-flavored beverage, I realized how infrequently I bake with oranges. Sure, I always look forward to creating new cranberry orange flavored recipes during the fall, but I often forget about baking with them the rest of the year, even though I eat oranges year round! 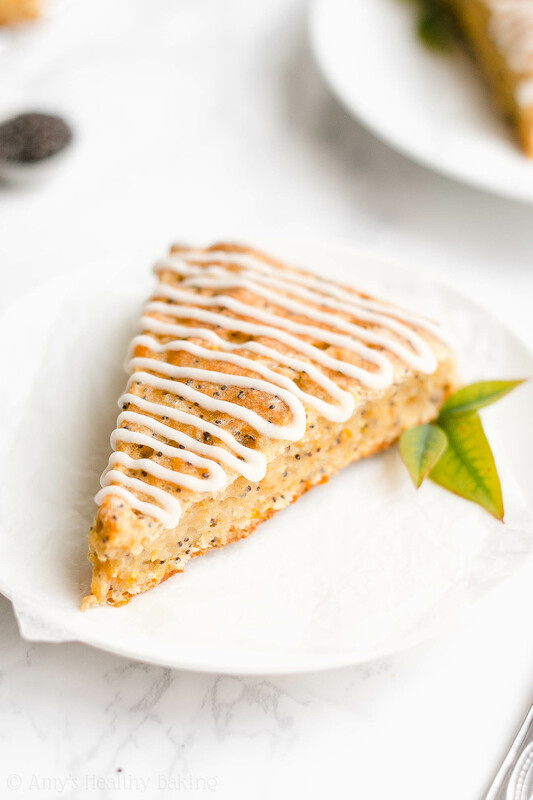 So once I felt healthy again, I worked on perfecting this new Healthy Orange Poppy Seed Scones recipe to share with you! These scones are supremely moist on the inside with a slight hint of a crust on the outside, and they have plenty of bright sunshiny orange flavor. 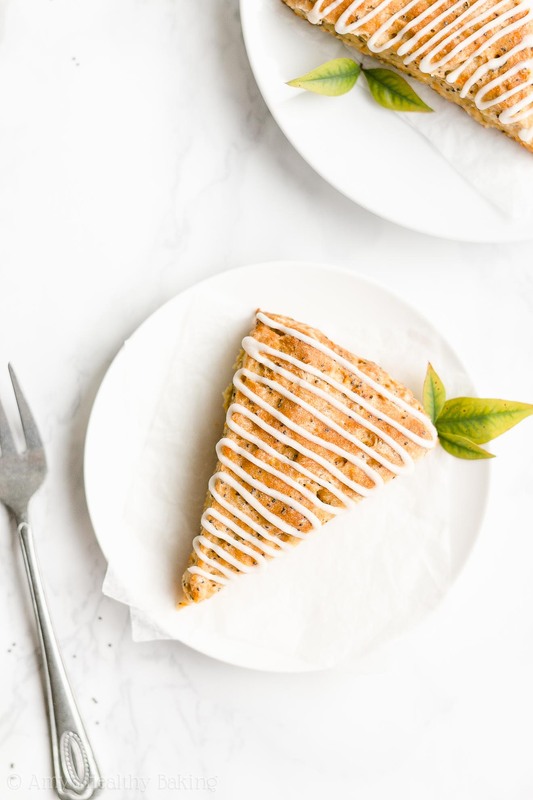 Such a fun twist on the classic lemon poppy seed pairing! Even better? 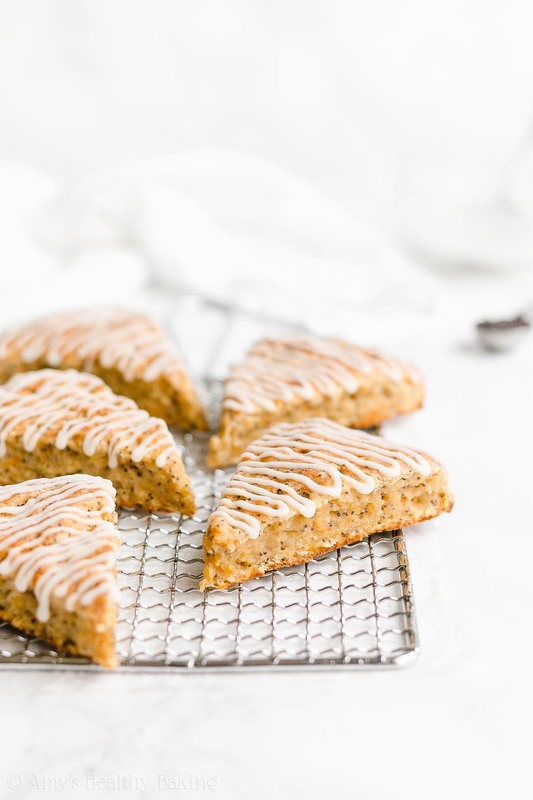 These healthy orange poppy seed scones contain no eggs, refined flour or sugar! Plus they require just one bowl and 30 minutes to make, and they’re just 139 calories! 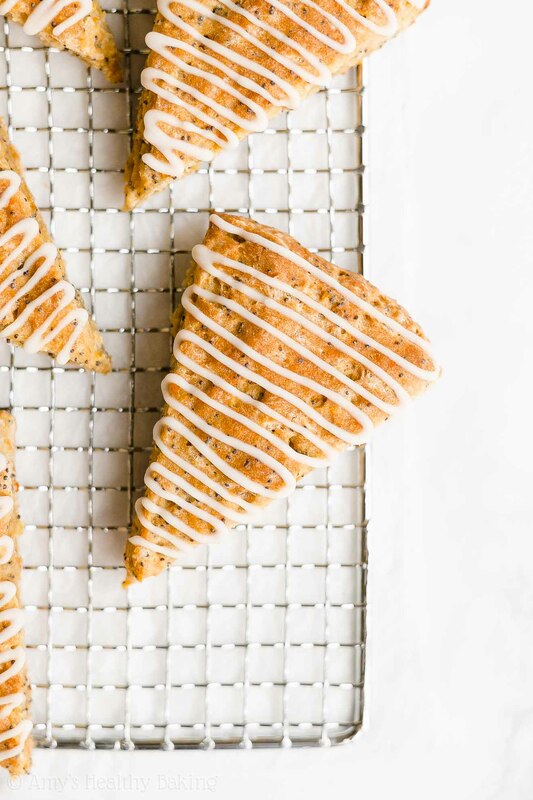 So let’s go over how to make these healthy orange poppy seed scones! You’ll start with… You guessed it… One bowl! And into that bowl, you’ll add white whole wheat flour, baking powder, salt, and poppy seeds. It’d be nearly impossible to make healthy orange poppy seed scones without the poppy seeds, right? I tend to add a tiny bit more than in most recipes to make sure there are lots of dark little specks in every bite! Yes, white whole wheat flour actually exists! It’s not a combination of white (aka all purpose) flour and regular whole wheat flour. Instead, white whole wheat flour is made by finely grinding a special type of soft white wheat (hence the name! ), whereas regular whole wheat flour comes from a heartier variety of red wheat. They both have the same health benefits (like extra fiber! 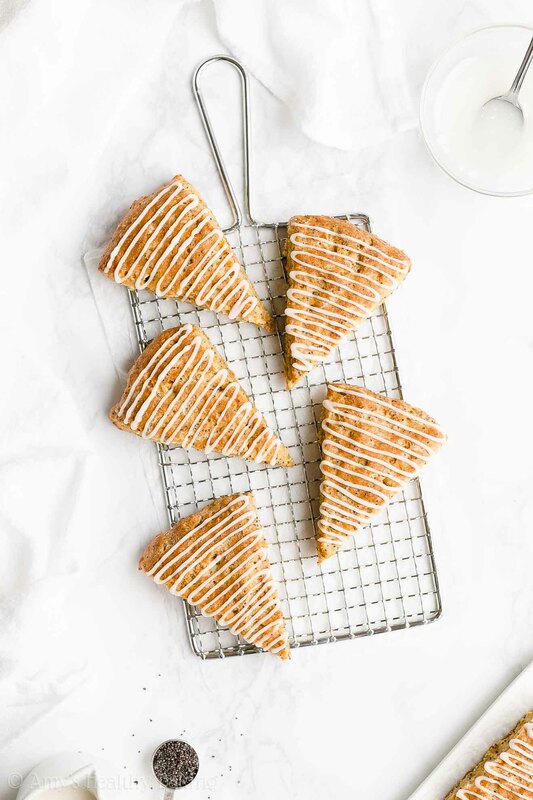 ), but white whole wheat flour has a lighter taste and texture, which lets the moist texture and citrus flavor of your healthy orange poppy seed scones truly shine! And speaking of fruit… It’s time to whisk in the first orange component: orange zest! The zest actually provides the majority of the citrus flavor, so don’t skip it! I use my handy zester, which makes the process fly by. Tip: I often recommend against using the smallest holes of a cheese grater. Many of these are duller than zesters, so you don’t get nearly as much of the peel… Which means the orange flavor won’t be nearly as strong. I highly recommend buying a zester like this, and they’re really affordable! Bonus Tip: Totally unrelated to healthy orange poppy seed scones… But did you know that you can use a zester for garlic too, instead of dicing it finely with a knife? So much faster and easier! With your orange zest now whisked into your flour mixture, you’ll cut in a small amount of very cold butter. Whereas traditional scones call for around ½ cup, if not more, you just need 2 tablespoons for these healthy ones. That really helps keep your healthy orange poppy seed scones low fat and low calorie! Just remember, it’s extremely important to use very cold butter. Straight from the fridge is fine—no need to freeze it! When the butter in your scones melts in the oven, it creates tender little pockets in the dough. This is why you don’t want your butter to soften or melt ahead of time. You’ll miss out on that irresistibly moist and tender texture! Tip: This is why I strongly recommend against coconut oil. Coconut oil melts at a much lower temperature compared to butter, which means it’ll start to soften as you mix together the dough… And therefore, you won’t get quite the same tender texture. 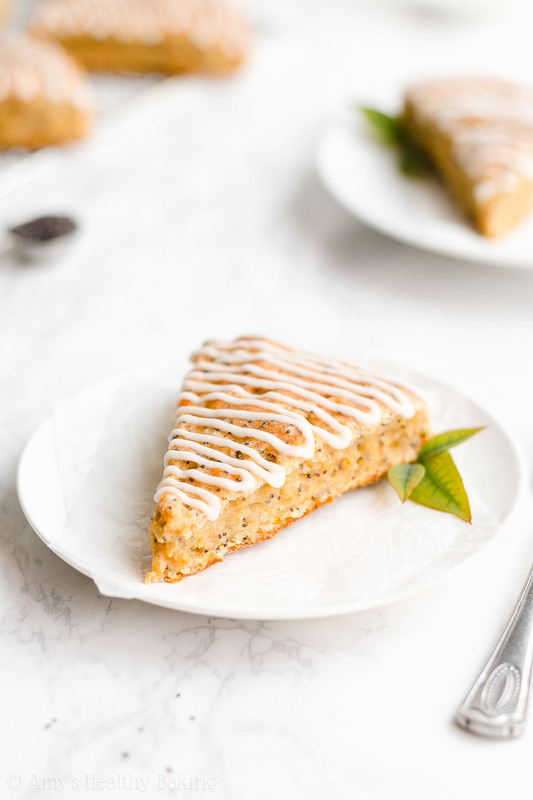 See the Notes section of this healthy orange poppy seed scones recipe for my vegan version! You’ll skip the heavy cream or whole milk often used in traditional scone recipes, and you’ll use Greek yogurt instead. Greek yogurt adds the same moisture as heavy cream or whole milk (or additional butter!) but for a fraction of the calories. It also gives your healthy orange poppy seed scones a protein boost! Time for the second orange component: freshly squeezed orange juice! 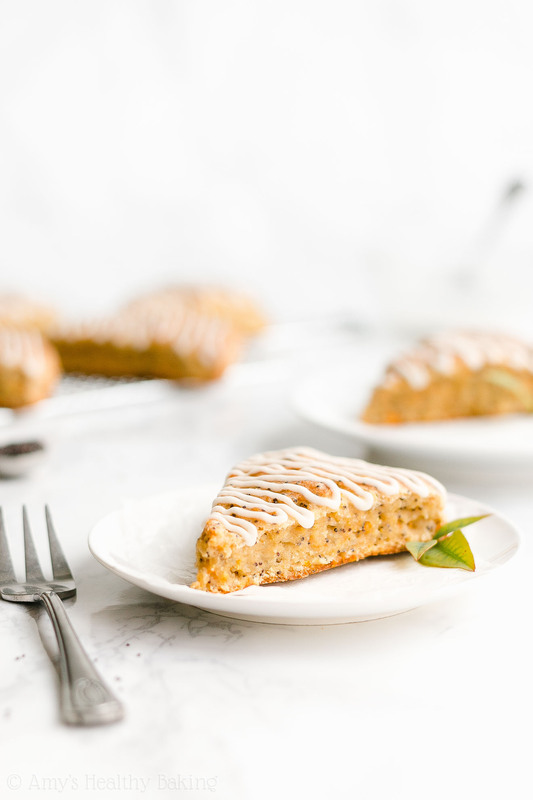 Although the zest provides the majority of that bright sunshiny flavor, the juice does add a bit… And it also adds natural sweetness to your healthy orange poppy seed scones! Then to boost the natural sweetness, you’ll also mix in pure maple syrup. You want the kind that comes directly from maple trees! Check the bottle. The only ingredient should be “pure maple syrup!” It generally comes in thin glass bottles or squat plastic jugs (like this!). Before you bake the dough, you’ll flatten it into a ¾”-tall circle and brush the tops and sides with milk. This seals moisture into the dough, and it also creates a hint of a crust on the outside. I love that subtle texture contrast! You’ll also slice the dough into 8 triangles. No need to separate the wedges! Just make sure your cuts go all the way through the dough. By leaving their sides touching, it keeps both their sides and insides supremely moist and tender. 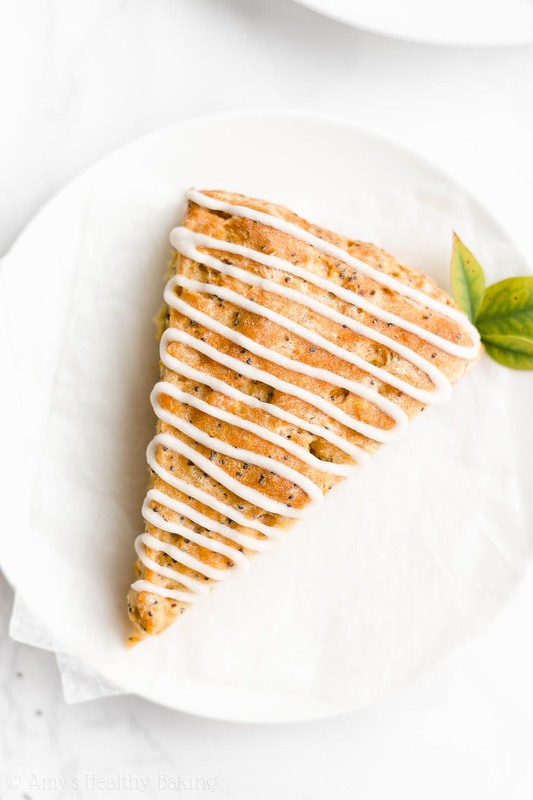 Then if you want to make your healthy orange poppy seed scones look a little prettier, you can add a sweet drizzle on top! It’s totally optional (I omit it half the time so I can eat the scones that much faster! ), but I do think it adds a nice finishing touch. Don’t you? The drizzle is really simple to make! Just stir together confectioners’ style erythritol (I buy mine online here!) and more freshly squeezed orange juice. Add that to a small zip-topped bag, cut off a tiny piece of one corner, and drizzle it all over your healthy orange poppy seed scones! Then enjoy every last crumb of your delicious breakfast treat! And when you make your own, remember to snap a picture and share it on Instagram using #amyshealthybaking and tagging @amyshealthybaking IN the photo itself! (That guarantees I’ll see your picture! ?) 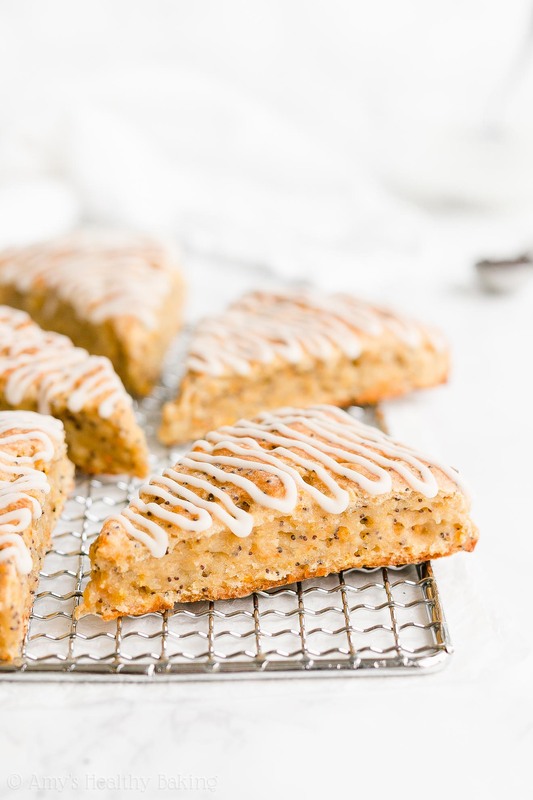 I’d love to see your healthy orange poppy seed scones! To prepare the scones, whisk together the flour, poppy seeds, baking powder, and salt. Whisk in the orange zest. Cut in the butter with a pastry cutter (highly recommended!) or the back of a fork until the mixture resembles fine crumbs. Make a well in the center. Add in the Greek yogurt, maple syrup, orange juice, and vanilla. Stir until just incorporated. Divide the dough in half, and transfer each half to the prepared baking sheet. Using a spatula, shape the dough into two ¾” tall circles, and brush with the milk. Slice each circle into 8 triangular segments with a sharp knife. (No need to separate them!) Bake at 425°F for 23-25 minutes, or until the tops are deeply golden. Cool on the pan for 5 minutes before transferring to a wire rack. Just before serving, prepare the drizzle by stirring together the confectioners’ style erythritol and orange juice in a small bowl. Transfer the mixture to a zip-topped bag, cut off a tiny piece of one corner, and drizzle on top of the cooled scones. Notes: Whole wheat pastry flour, regular whole wheat flour, or all-purpose flour may be substituted for the white whole wheat flour. Don’t skip or skimp on the orange zest! It actually provides the majority of the citrus flavor. I love my handy (and totally affordable!) zester. It works much better than the smallest holes of a cheese grater! In a pinch, coconut oil may be substituted for the butter, but the texture of the scones will be affected. Very cold butter is required to achieve their tender texture, and since coconut oil melts at a much lower temperature, the results will not be the same. Instead, I recommend the vegan version below! In the drizzle, I buy my confectioners’ style erythritol online here. In a pinch, regular confectioners’ (powdered) sugar may be substituted for the confectioners’ style erythritol. However, regular powdered sugar is more absorbent, so start with ½ teaspoon of orange juice and add more as necessary to achieve the desired consistency. Oh my goodness, Amy! I love these!! I have always really enjoyed orange poppy seed muffins and I would have never thought about trying this flavour in a scone! I just want to say that, having discovered your site a couple of months ago, I am soooooo impressed with your lovely, healthy recipes! You are so clever! Last year I started clean-eating and I have been looking for recipes that allow me to make (and freeze!) yummy treats — things that make me feel like I’m not depriving myself. 😉 I am gradually stocking my freezer with your baked treats (So far, I have apple cinnamon muffins, chocolate pancakes and these beautiful scones). Awww, Amy, thanks so much for your lovely response! I’m so very happy to be able to give you this feedback and my heartfelt thanks. <3 Your recipes are helping me stay on track with healthy eating and it’s so exciting to learn to bake good, nutritious snacks from scratch! I’ve also tried your Ultimate Healthy Gingerbread Cookies and your Ultimate Healthy Crunchy Chocolate Chip Cookies – both of which I adored! In fact, I’m going to remake these and freeze some too (so that I have a good selection of healthy snacks to take to work 😉 ). You’ve even inspired me to purchase a PROPER (Microplane) zester and some incredients I haven’t tried before (such as liquid vanilla stevia and ethrythritol). I live in Newcastle, Australia, and I’m spreading the word to friends and family about your excellent site. I’ll keep in touch as I try even more of your recipes. My next adventure will be your Healthy Fudgy Dark Chocolate Nut Brownies… As a chocoholic and brownie lover, I can’t wait! Your sweet comment made my entire day Tanya! Thank you SO much!! ♡ I’m so incredibly honored that you’ve tried and loved that many of my recipes, as well as invested in tools and ingredients that I’ve recommended to make them. I’m truly grateful that you trust me, my recipes, and my guidance — and shared my site with your friends and family! Wow!! You’re such a gem Tanya! Thank you, thank you, thank you!! 🙂 And I’m so excited to hear what you think of the brownies too! These turned out nice! I like the flavor. I made 4x the recipe again, using hard red wheat, full fat greek yogurt, and 2% milk… and the only problem I ran into was that the 23 minutes in the oven was a bit too long for a proper golden browning. So the first batch came out overdone (dark brown, but not black thankfully). 19-20 minutes in the oven worked best for me. These make nice bites to pull out of the freezer! I like that they’re not as sweet as some of the last recipes I tried. Oh, and I did not make any of the icing to go with them. I’m so glad you enjoyed these scones Marianna! That means a lot to me! 🙂 Do you have a convection-style (fan assisted) oven, by any chance? The baking temperature for convection ovens typically need to be reduced by about 25°F compared to what my recipes state; if baked at the same temperature, the baked goods often turn out overdone or burnt. I’m wondering if that’s what happened to your first batch!